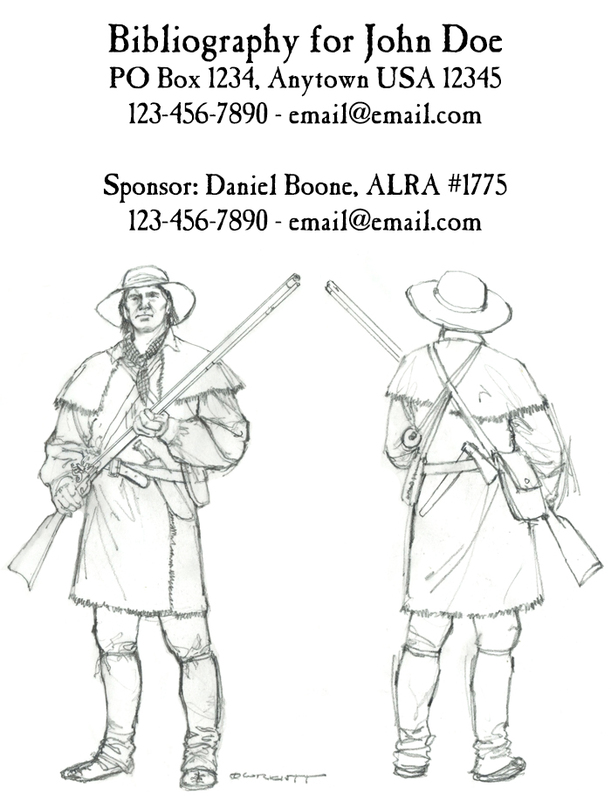 Information about the American Longrifle Association. NOTE: These guidelines are not part of the ALRA Bylaws and can be updated with a unanimous vote by the members of the National Standing Committee on Authenticity (NSCA). They are compiled by the NSCA to help expedite the bibliography submission and approval process for you, your sponsor, and the NSCA committee members. The purposes of the bibliography are to enable the National Standing Committee on Authenticity (NSCA) to ensure that high standards of authenticity are met within the ranks of the ALRA, and to instill a desired perspective toward research and documentation of the clothing and equipment you use. Your name, mailing & physical address, telephone number, & email address. Your Sponsor's name, ALRA Patriot number, telephone number, & email address. Full-sized front and rear photographs (at a minimum) of you wearing your clothing and the equipment you normally carry. (As shown in this drawing by David Wright - Thank you to David for drawing this specially for our bib guidelines). The ALRA bylaws list a number of items that are REQUIRED BY EVERY MEMBER TO HAVE, REGARDLESS OF PERSONA (listed below), and each item must be documented and color photographed. The simplest and most efficient way to present documentation and photos to the NSCA is to list your items in the same order as the required list, and to show the documentation and photos with each item (see example A below). You will need two sources for each item. At least one citation must be from a PRIMARY source as defined by the NSCA. The other may be an additional primary or an authoritative SECONDARY source (see definitions at end of Guidelines). The source must substantiate the time period being portrayed (the date of the source must be before the time period). Cite the author, book or document name, page and plate number, etc. Photos of each item are required (the full-persona photos alone will not suffice). Please show as much detail and use as close-up of a shot as possible. Multiple items (for example, shooting pouch contents) may be photographed together as long as photos are clear and show relevant details (see example B below). If photos are unclear, your approval could be delayed until clearer photos are received. If you are printing out photos separate from text, they will be accepted. Ideally, the photo would be attached (stapled) to the corresponding page. If the pictures are not attached to the page where the description is located, please label them well so they can be matched up with the item. An accouterment need not be an exact copy of an original; a reasonable extrapolation is acceptable. DO NOT PHOTOGRAPH ANY ITEM THAT YOU DO NOT DOCUMENT. Items pictured but not documented may cause delays in your approval. NOTE: You will notice in the list of items in the bylaws (see below) that there are several items that are not required but recommended for shooting and thus do not need to be documented. While documentation is not needed, please photograph these items as well so that the NSCA members may confirm period correctness etc. All primary and secondary sources need to be cited. You may cite them in the documentation of each individual item, or you can make a list of all sources at the end of your bibliography. Cite the author or editor, source name, page and plate/table number, publisher, etc. Sources obtained from the Internet must include their URL. You may want to look over the ALRA Recommended Reading List for sources. Proof of current dues may be in the form of a copy of a processed check or a letter (or email) from the current Natl. Factor stating that dues are paid up. Bibliographies may be submitted in printed copy or digitized*. Keep one copy for your records (if the NSCA has questions, they may need to refer to certain pages, etc.). Four copies are sent to your sponsor, along with a check for $13 made out to the current chairperson of the NSCA for postage and handling. Send the four copies and the check to your sponsor. Your sponsor will attach a cover sheet showing that the sponsor has seen the bibliography, is pleased with it, and recommends its approval. The sponsor will forward three copies and the check to the chairperson of the NSCA. * Digitized versions may be in the form of cds (3 copies still required & mailed to NSCA) or may be cloud-based (such as a drop-box or Google-doc). Funds will still need to be mailed to NSCA chairman before review can take place. The chairperson will forward copies of the bibliography to the other two members of the NSCA. All will review the bibliography and vote to accept it or not. Two of the three members must vote for approval if it is to be approved. If the bibliography is approved a copy will be forwarded to the ALRA National Historian. If it is not approved, the NSCA chairman will contact your sponsor with information about why the bibliography was not accepted and what needs to be done to improve it so it will pass. Once the bibliography is approved, the new Patriot will be notified of the approval, assigned a permanent Patriot number, and awarded an ALRA gorget. Due to the amount of shipping, reviewing of documentation, and correspondence that must take place, this process can take several weeks. Men and women's clothing should be described in detail. Descriptions should include the type of material of construction, leather, cloth, wood, etc. and types of buttons or closures, cloth patterns and style, etc. Clothing should adhere to documented patterns. All equipment used should match the character and time period being portrayed. Possible bag or haversack. Accepted alternatives would be a wallet, knapsack, snap-sack, etc. Tomahawk or belt ax, hand forged or cast, brass or iron. Fire set - bow drill or flint and steel. Period eating utensils, such as a bowl, spoon, or fork. Water vessel, such as cup, canteen, jug, or wood barrel. Salt and seasonings in period-correct containers. Sewing equipment: needles, linen thread or sinew, bee's wax, and awl. Candles (Bee's wax, tallow, or other period-correct material). A period flintlock. The gun cannot be of a later period than the character chosen. Powder horn or other documented powder container. Describe the powder container's features such as length, material and engraving. Hunting pouch or cartridge box. Describe its features. A whisk brush, vent pick, and powder measure. These are often suspended from the hunting pouch. 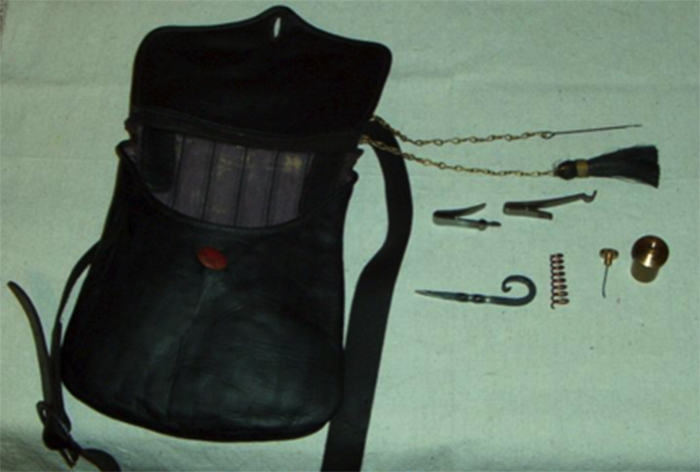 Bullet bag, Rolled cartridges, Priming horn. Cloth patching, Lock cover "cow's knee". Bullet mold, Flints, Screw-driver, Knapping hammer. Again, these items are not required. It is only necessary that a member be able to load, shoot, and properly maintain the flintlock, from the bag, with efficiency. When attending ALRA events one should be prepared to shoot at least 25 rounds. As you research your persona you will determine what clothing and accoutrements are needed. If you have a question that your sponsor cannot answer, have your sponsor contact the NSCA Chairman for clarification. Primary source. A contemporary account of, or the description of, an item or article of clothing. These may be official documents, diaries, first hand written accounts, newspapers, or paintings or engravings of the time period. Books and published articles that describe equipment and clothing that are in museums and are presented by authoritative sources are acceptable as a primary source. An archaeological recovery and the reports of that discovery giving dates, locations, etc., are to be considered a primary source. Secondary source. Sources that review and interpret primary sources. Secondary sources may provide more information about an item because they review more than one primary source. Secondary sources may include reproductions of original pieces as examples. Secondary sources should be scholarly and by recognized authorities. They are used when a second primary source cannot be found. PLEASE NOTE THE GUIDELINES BELOW ARE THE OLD GUIDELINES AND ARE LEFT HERE FOR ARCHIVAL PURPOSES. Note: These are not part of the ALRA By-laws and do not require the amendment process to change. The NSCA may change these in accordance with amendment four. The purpose of the bibliography is to assist the National Standing Committee on Authenticity to insure that high standards of authenticity are met within the ranks of the ALRA. It also instills a desired perspective toward research and documentation of equipment used. To assist the prospective; member in an enjoyable and cost effective experience, the guidelines must be followed and the candidate must:. Include proof of payment of dues. 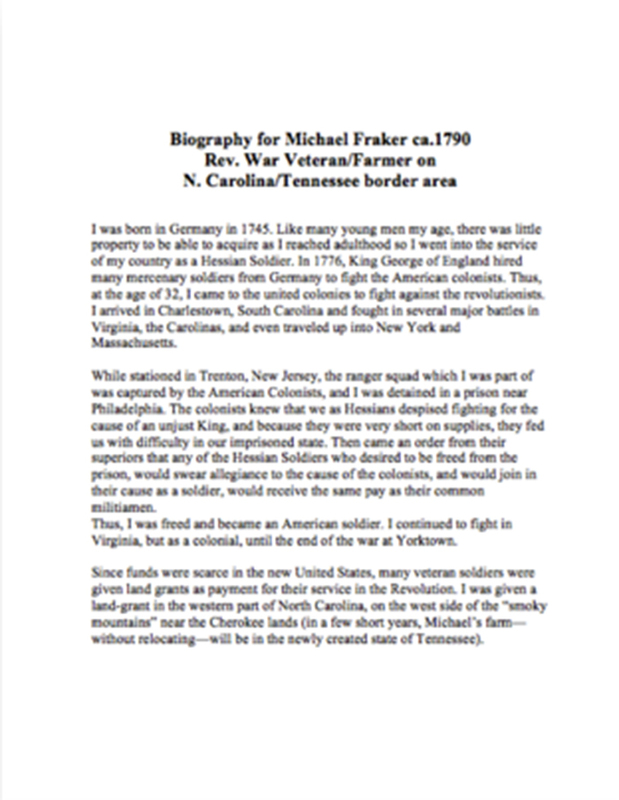 Include a description of the chosen character and include his or her occupation, the geographic location, the date of his or her sojourn, and other information deemed important about the character portrayed. Clothing and accouterments detailed in the bibliography must be tied to this date and character. Two sources must be listed for each item. One source must be a PRIMARY source as defined by the NSCA. The second may be an additional primary or an authoritative secondary source. Cite the author, book or document name, page and plate number, etc. The source should substantiate the date of use of the item. In some instances the date of use may be implied by the source. Include color photographs of the front and rear of the candidate. He/she should be dressed, including his/her equipment. Additional photographs of all documented clothing, equipment, and firelock should be included. Please show as much detail and use as close-up a shot as possible. All members are free to portray any authentic character of the period. Men and women’s clothing should be described in detail. Descriptions should include the type of material of construction, leather, cloth, wood, etc. and types of buttons or closures, cloth patterns and style, etc. Clothing should adhere to documented patterns. Accouterments: The equipment used should match the character being portrayed. Knife with properly attached handle of period materials. It is not required the knife be hand forged; and hi carbon steel is acceptable, but stainless steel and aluminum are not acceptable. Fire set, bow drill or flint and steel. Salt and seasonings in period containers. Gun oil and cleaning equipment. Sewing equipment: needles, linen thread or sinew, bees wax, and awl. Powder horn or other documented powder container. Describe the powder container’s features such as length, material and engraving. The following are recommended, but a specific source of documentation need not be given. However documentation you provide will be recorded and used to aid others in their research, therefore will be appreciated. Gun oil or grease in a period container. Traditional cleaning with clear water is expected at ALRA events. The following items are common and must be of period design and materials:. Cloth patching, Lock cover "cow’s knee". Bullet mold, Flints, Screw driver, Knapping hammer. These items are not required. It is only necessary that a member be able to load, shoot, and properly maintain the flintlock, from the bag, with efficiency. When attending ALRA events one should be prepared to shoot at least 25 rounds. 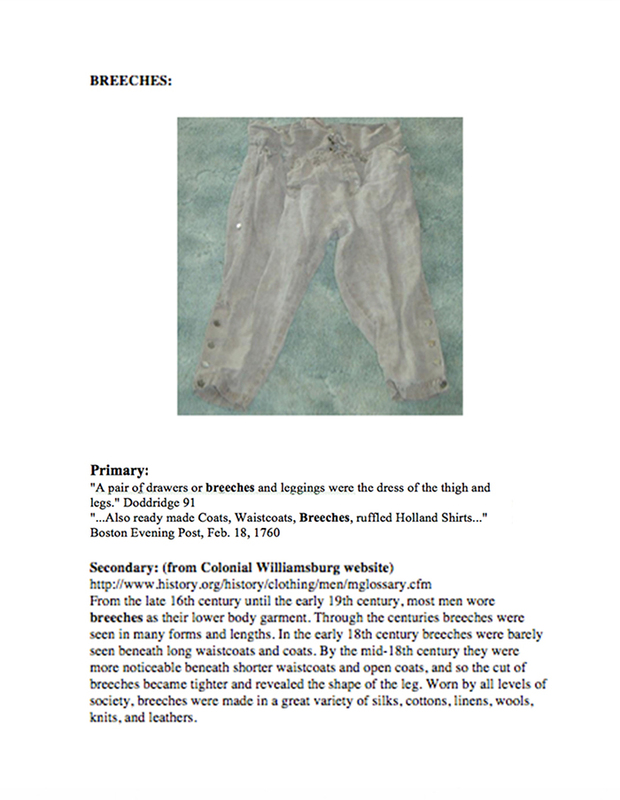 Other historically correct items may be carried in the hunting pouch according to the individual’s character portrayal. Clothing should adhere to known and documented period patterns. It is the responsibility of the member to incur the cost of postage and handling of the bibliography. Make four copies of your bibliography. Keep one copy for your records. Three copies are to be sent to the NSCA via your sponsor. Include a check for $13.00 made out to the chairperson of the NSCA for postage and handling. Include proof of current dues paid membership status, your sponsors name and Patriot Number. Give all of your bibliography materials along with the necessary shipping and handling fees to your sponsor. Your sponsor will then review your bibliography and submit it to the chairperson of the NSCA. Include your twentieth century name, address, telephone number, e-mail address and any other personal information needed by the committee to contact you and your sponsor. The chairperson will forward it to the other committee members for their review and vote. When all of the ballots are returned and the bibliography has been approved it will be forwarded to the ALRA National Historian. If the candidates bibliography is not approved the bibliography will be returned to the candidate’s sponsor with information about why the bibliography was not passed and what items require re-documentation. The new Patriot will be notified of the approval of his/her bibliography, assigned a permanent Patriot Number, awarded an ALRA gorget, and sent information about how to receive their ALRA gorget. Due to the amount of shipping, reviewing of documentation and correspondence that must take place, this process can take several weeks. Your patience is appreciated. A primary source is a contemporary account of or the description of an item or article of clothing. (Events are not included, as we are not discussing events here.) These may be official documents, diaries, or first hand written accounts. The use of contemporary newspapers should be included. An archaeological recovery and the reports of that discovery giving dates, locations, etc. are for our purposes to be considered a primary source. Books and published articles that describe equipment and clothing that are in museums and are presented by authoritative sources should be acceptable as a primary source. In this case the items provenance must be known and the information must not rely on other primary sources for proof. Secondary sources are those sources that review and interpret primary sources. Secondary sources may provide more information about an item because they review more than one primary source. Secondary sources may include reproductions of original pieces as examples. Secondary sources should be scholarly and by recognized authorities. They should be used when a second primary source cannot be found. The guidelines are now going to require two sources for every item. One source must be a primary source.